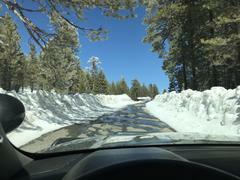 On 03/13/19, at about 1340 hours, the Lockwood Valley Sheriff’s Station received a call from (P) Jeffrey Everhard who stated he had been cross-country skiing on Mount Pinos and was now lost. 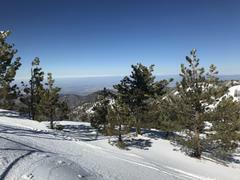 The Mount Pinos summit, 8,847’ above sea level, is located in northern Ventura County bordering Kern County. Everhard reported his only provisions were one 8 ounce can of water and a box of raisins. Everhard said he had reached the Mount Pinos summit and then traveled east. Everhard realized he had traveled south while he intended to go east and was unsure of his location. Everhard did not have a cellphone capable of providing his GPS location and did not have a GPS device with him. Everhard also stated his cellphone was not activated and was only working because he had dialed 911. A deputy from the Lockwood Valley Sheriff’s Station spoke with Everhard before responding to his location and instructed Everhard to retrace the path from which he had come from if he was able. Everhard was instructed to stop and shelter in place if he lost his previous tracks at any time. 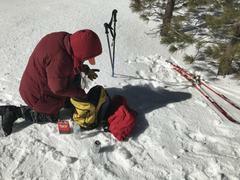 The deputy responded to the Mount Pinos trailhead and began the two mile one way trek to the summit using snow shoes due to the amount of snow. The temperature was 31° at the trailhead with gusty winds. As the deputy approached the summit, he received a telephone call from Everhard stating he had retraced his tracks to within about 200 yards from the repeater towers at the summit. The deputy searched a large area around the summit for about thirty minutes before spotting Everhard about 1000 yards to the southeast of the repeater towers near the summit. Everhard was located and reported he was feeling dehydrated and lacked energy from improper nutrition. Everhard was provided water and food before the deputy guided him to the trailhead. Everhard was guided back to the trailhead without incident. At 63 years old, Everhard stated he had 50 years of outdoor experience including all-season mountaineering, ski guide, and as an outdoor instructor. Everhard said that if he had not called 911 when he did he would have continued in the wrong direction and “would have been in a world of hurt.” Everhard had not thought to retrace his tracks and believed he would have been lost on the icy hillside overnight if he had not “humbled” himself and called 911. Everhard had not told anyone where he was going to be skiing and admitted he was lucky to have been able to make a call. Everhard wanted to ensure others could learn from his mistakes even as an experienced cross-country skier and outdoorsman. It is imperative that those recreating in the outdoors prepare by telling someone where they are going to be and when they are expected to return. Additionally, having the proper provisions, clothing/equipment, and navigational tools such as maps, compass, and GPS are essential to ensure your recreational activities are done safely and responsibly. The Lockwood Valley Sheriff’s Station commends Everhard for his resilience and determination to be located.